Join us for a Crisis Communications and Crisis Leadership Workshop! Are you a mid- to senior-level communications professional who wants to strengthen your skills in responding to a crisis or emergency? 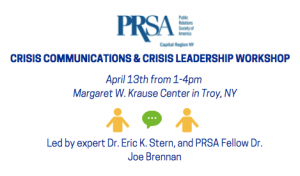 The PRSA Capital Region Chapter is pleased to present an outstanding workshop during which practitioners will learn new strategies and tactics for providing leadership in crisis situations. The workshop will provide participants with actionable best practices, relevant to communications professionals working across a range of sectors including agencies, government, higher education, health care, nonprofits, technology, large corporations, or small- to medium-sized businesses. Eric K. Stern, Ph.D., professor at the University at Albany who has published extensively in the fields of crisis and emergency management, crisis communication, resilience, security studies, executive leadership, foreign policy analysis and political psychology. Dr. Stern has conducted hundreds of crisis trainings in the USA and Europe. Joseph A. Brennan, Ph.D., APR, a Fellow of PRSA, and well-known in the Capital Region as a public relations leader with more than 25 years of experience in PR, marketing, communication research and planning, media relations, advocacy and public affairs, brand strategy, employee communications, digital and social media, issues management, and crisis communications. He has directed messaging and served as spokesman for dozens of critical incidents, including allegations of racially-motivated violence on the UAlbany campus in Feb. 2016. As part of the workshop, participants will receive a copy of Dr. Stern’s newest book, The Politics of Crisis Leadership, 2nd ed. (a $25 value). Admission is $100 for members of PRSA or AMA, and $150 for non-members.